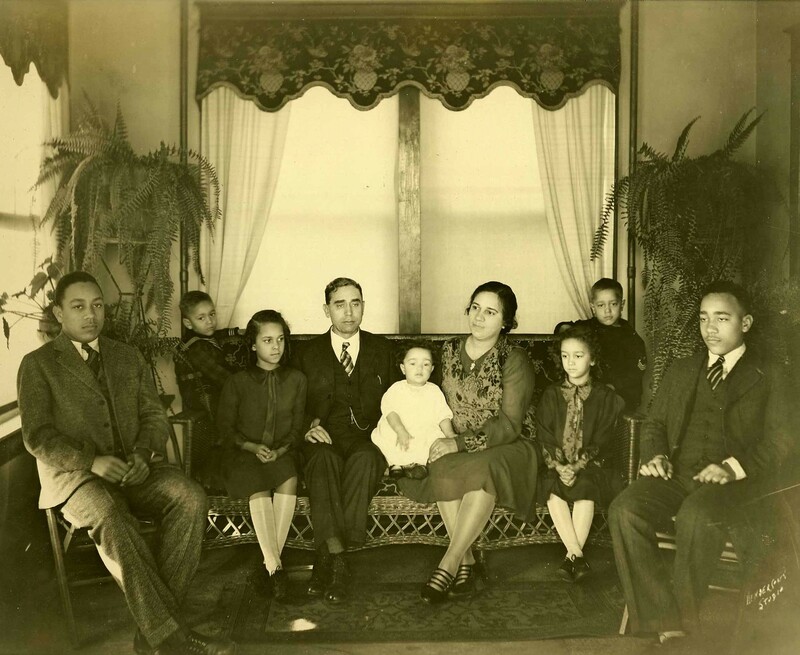 Dr. John Claytor, his wife Roberta, and their seven children sit for a formal family portait in their home. The two eldest boys, in the foreground, wear suits and ties while the two younger boys stand behind the wicker sofa which holds the their father, mother, and three sisters. Floral valences top the widows, and large ferns stand at either side. When Helen Jackson Wilkins traveled in the South for the YWCA, African-Americans were not allowed to stay in hotels. When in Roanoke, Virginia she stayed with Dr. John Claytor's family. In the 1940s when she visited Grand Rapids, again for the YWCA, she recognized Dr. Robert Claytor's name at a meeting and learned that he was the brother of the Roanoke doctor. They were married in 1944.